STAR strategies + architecture – Rotterdam | Acrobatic Narratives. Institutionalized Activism, Poetic Demagogy, and Creative Propaganda. Acrobatic Narratives. Institutionalized Activism, Poetic Demagogy, and Creative Propaganda. Bernd Upmeyer and Beatriz Ramo interviewed Wouter Vanstiphout* on behalf of MONU magazine. Wouter Vanstiphout is a member of Crimson Architectural Historians in Rotterdam. He is professor of Design and Politics at the Faculty of Architecture of Delft Technical University. The conversation took place at the Crimson Office on September 14 at 9 am. *Wouter Vanstiphout: is a member of Crimson Architectural Historians. He is professor of Design and Politics at the Faculty of Architecture at Delft Technical University. He has (co)authored books including Mart Stams Trousers, Stories from behind the scenes of Dutch Moral Modernism (Rotterdam 1999), Too Blessed to Be Depressed Crimson Architectural Historians 1994–2002 and The Big WiMBY! Book Future, Past and Present of a New Town (Rotterdam 2007). From 2000 to 2007 he and Crimson directed the urban transformation project of the Dutch New Town of Hoogvliet. BR: We would like to discuss with you some delicate issues around the current understanding of ideology, or better, the flexibility and malleability that “ideology” has been put through until becoming a brand. From general, large-scale city strategies to much smaller interventions in Rotterdam, examples of success as branding operations but questionable in the transparency and honesty of its message, which is heavily loaded with rhetoric about the public, the social, the participatory, the creative…etc. We are confronted by plenty of these ideologies which turn into highly hypocritical and unethical promotional strategies. How does one judge that? Would you be able to justify them? BR: We see more and more groups and collectives that call themselves ‘activists’ whose manifestoes lay in the social, urban participation, social action, etc. Although conceived with the best of intentions, often the results of their actions are closer to a celebration of themselves as the protagonists of their activism rather than a committed action with a serious outcome. What do you think about this urban activism displayed all around Europe? WV: There are offices that do it in an authentic way, out of a real feeling of anger or commitment… and that is fantastic. And there are many offices that are exactly as you said… There is a change in the cliché of the figure of the architect. Twenty years ago the cliché was a bit Spanish-looking: cultured, qualitative, formalist, intellectual…And then Rem [Koolhaas] came and the architect became this ruthless robot man, destroying everything we found comfortable; being awful to everyone… And everybody copied that model, from Ben van Berkel to every single Swiss architect in the world under 50. WV: (…) This strange lightness of these groups of architects is not really dangerous for society, it’s just useless for society… it is just dangerous for themselves. That is why I am so fascinated with what many young offices are doing, will they succumb to the comfort zone of the creative industry deal, providing lightweight actions, that are really just designer objects, or will they find their own position, their own discourse, shed their roles of bad boys and girls in designer magazines and developer boardrooms? BU: In this a-critical moment, do these tricky and popular “ideologies” offer a great chance to designers and urban planners, who in the name of the social or the green can act with more freedom? BU: With what kind of urban ideologies do you think we are dealing at the moment? How do they relate to urban ideologies of the past? BU: Once we accept the failure and impossibility of true ideologies, how do you see the tendency of borrowing the esthetics and imagery of brilliant past ideologies and stripping them from their meaning and turning them into current dogmas? BR: For example, the fascination with the images from Superstudio’s Monumento Continuo, which were made to fiercely criticize capitalism, globalization, and the last Modern Movement of the sixties, but now these images are taken almost as real architecture proposals because of their striking beauty and monumentality. Isn’t it a little awkward the usage of images without regard their initial meaning? You also see this with some of the neo-neorationalist architectural hypes being taught at the AA, Harvard, and the Berlage Institute, this armchair flirting with communism and socialism, without any real political engagement. Within the world of architecture, dead and buried ideologies are being used as designer objects, attributes or talisman, that get you access to tenure tracks, magazines and conferences. Title: Acrobatic Narratives. 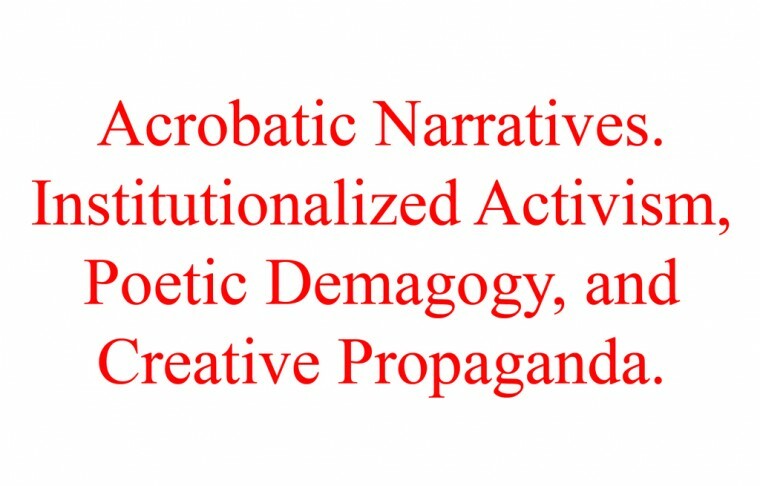 Institutionalized Activism, Poetic Demagogy, and Creative Propaganda.